Discussed below is a brief summary of the Datsun 510 nameplate. This includes features, specs, restorations, uses and more. This is a culmination of various resources online. 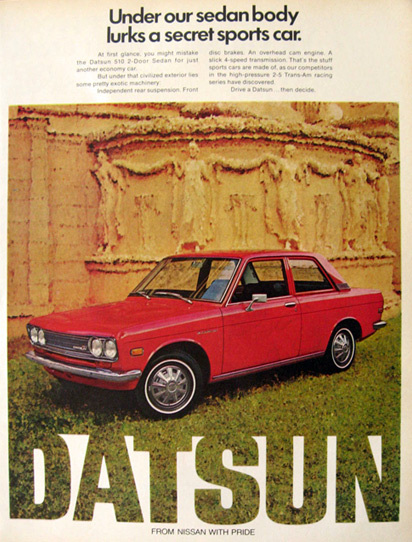 Features & History: At the time of the Datsun 510’s introduction to the market, German luxury cars were very popular. Thus much of the style and design of the 510 was impacted by automobile manufacturers such as BMW, Mercedes Benz as well as other luxury car makers like Jaguar, Porsche and more. 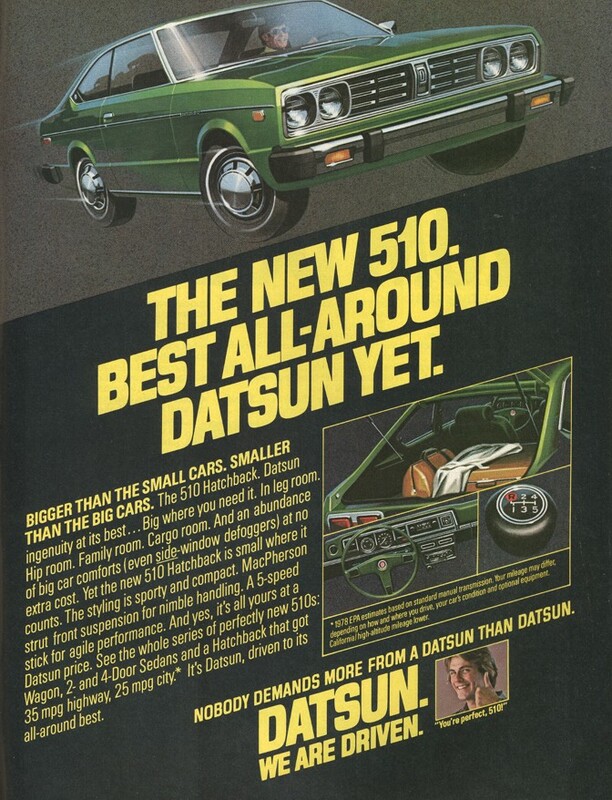 Datsun purchased much of the 510 design when they bought Prince Motor Company and utilized the experience of Teruo Uchino to create the European style. The Datsun 510 features an old school luxury car look and boxy lines reminiscent of high end cars from the late 60s and early 70s. The Datsun 510 was modeled heavily after other luxury cars in the market at the time. The Datsun 510 was unique in that it provided the consumer with many options not only in engines but also in body style. This is common today however at the time was not regularly practiced in the auto industry. The five door station wagon was one of the more popular designs and is highly sought after in today’s used marketplace. The wagon was a compromise for owners that wanted a balance of storage capacity and performance. The 510 Wagon featured various I4 engines and two transmission options. The wagon market has shrunk today with the rising popularity of SUV models and Crossovers. The 510 Wagon has a retro style that many nostalgic car collectors seek. Although all 510 body styles are highly sought after by rally enthusiasts and classic car guys, the wagon is by far the most popular of the three. As with all of the body styles, the Datsun 510 Wagon is often restored or built out / modified. While some wagon owners aim to return the vehicle to a stock retro look, others aim to add new school performance technology and blend modern lines into the classic body style. Check out our Wagon page for various pictures and videos from 510 Wagon owners who have made improvements, mods and restored classic wagons. Along with various body styles the 510 was made available with two different transmission types. This included both a four (4) speed manual and a three (3) speed automatic. Various engines were also offered through the production run. Refer the quick facts menu above. Gas mileage for the day was an unheard of 20 to 30 mpg. This is impressive for a time when fuel economy was not a concern to drivers. It should be highlighted that not all options were available in every market that the Datsun 510 was sold. 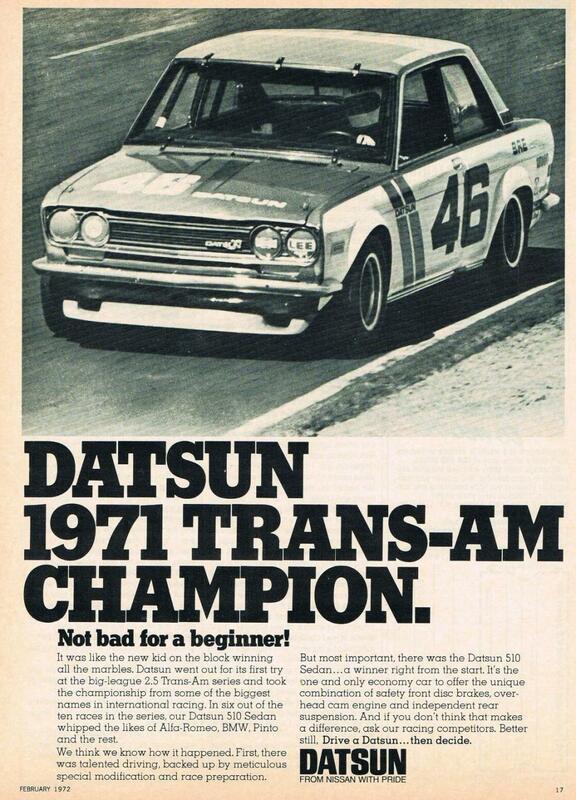 When the Datsun 510s popularity rocketed forward was when it finished first in its classat the Trans Am Series in both 1971 and 1972. The Trans-Am Series originally known as the Trans-American Sedan Championship was created by Sports Car Club of America (SCCA) as a platform for modified racing sedans to compete. When the 510 won, it became highly sought after in North America as well as Australia and New Zealand. Other popular regions were South Africa and Japan. The high use of the Datsun 510 as a rally and motor sport vehicle has led to a shortage in the used market. It is particularly difficult to find them in good condition today. A common repair that must be made to legacy Datsun 510s is that of replacing or upgrading the suspension particularly the shocks.